One could write at phenomenal length about the many tricks touts use to illegitimately improve their record, but I'll try to keep this relatively short. The BLAP picks are posted daily in a college basketball thread at Pregame after the relevant games are over. It is generally quite a bit easier to win at sports betting when you're posting your plays on games that have already happened. In theory, a neutral third-party could be sent the BLAP picks via text very shortly before or after the games started, and they could be verified that way. But the same person who was comped a subscription at LVA Sports and tracked Fezzik's records from 2009-2012, ComptrBob, has offered to do exactly that, without being taken up on his offer. Clearly, it's unreasonable that nobody is willing to pay $1000/month for the privilege of spending a bunch of time tracking picks they believe to have no value. This alternate reality, where Fezzik's picks are so valuable that you'd want to use them to bet into whatever the first available live betting line happens to be, must be a fascinating one. Obviously. Just in case you're still giving these guys the benefit of the doubt with respect to keeping an honest record -- and I'm not sure why you would be -- the post-posted BLAP record itself appears to be riddled with errors and inconsistencies. There was also the time that Fezzik posted a day of BLAP WNBA picks, which went 3-1 for +2.9u, yet they somehow showed up in the BLAP record as 3-0, +5.0u. 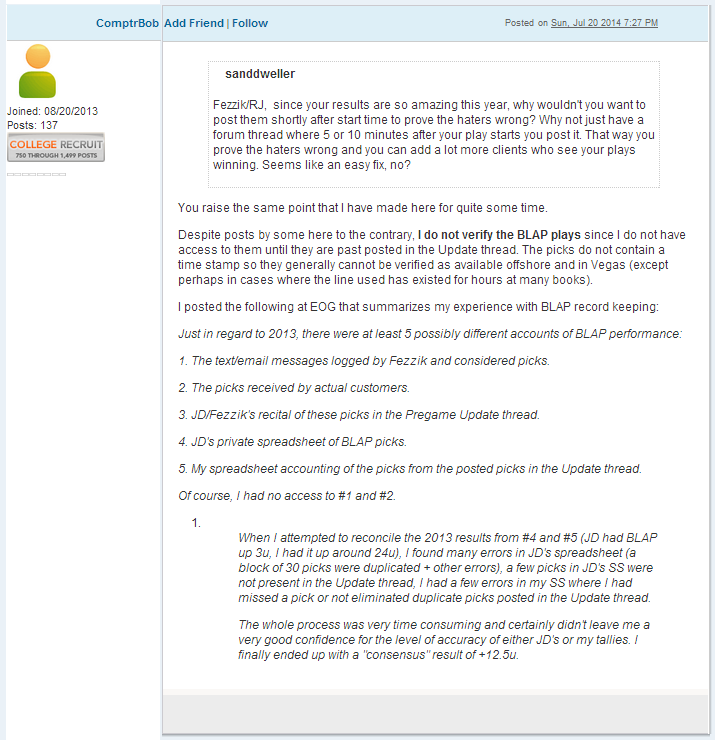 When ComptrBob tried to verify the 2013 past-posted BLAP results, he found "many errors" in the relevant spreadsheet. Predictably, this has been a recurring problem, to the extent that Fezzik can't even accurately recall his own results. Although that last issue is actually somewhat understandable, considering the "amazing differences" between his various programs. And this may come as a shock, but about 18 months into his Pregame career, Fezzik is a big winner on his past-posted BLAP plays, while being down on his (easier to verify, although still far from perfectly tracked) individual picks for sale. Step 4: Dismiss dissent with nonsensical accusations. Similar to Fezzik's previously mentioned alternate reality, Bell also lives in a world which seems quite foreign to most of us. @bikezilla @FezzikSports @ESPN_Colin You are either not aware of Fezzik's resume, or for some reason biased. If the 1st, I suggest research. @bburch22 @TheBigLead 50 followers after 3,864 tweets. The market is telling you your biased, inaccurate, hateful view is not valued. @cordongole @chadmillman Hopefully you simply had a wrong impression rather than an agenda.You can't win without valuing the truth. @DavidHollidge Feedback on the article as been amazing. Those with an agenda are simply louder on Twitter. After also considering all the people he's blocked on Twitter, the posts he's deleted at Pregame, and the losing records of his touts he's ignored, it appears that Bell has to do quite a bit of work to maintain this truthful, agenda-free world where people pay for the picks of touts that he knows are long-term losers. 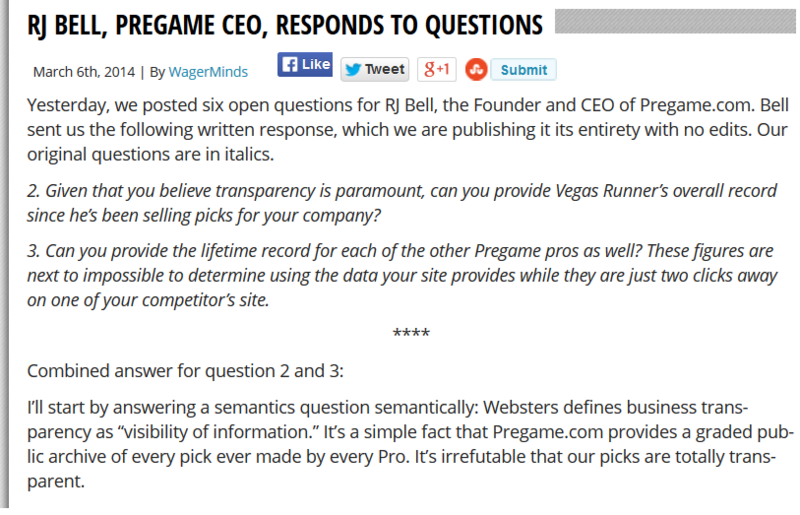 Kind of makes you wonder how Webster's would define an "element of a scam", doesn't it? Next Long Con post: "Transparency"